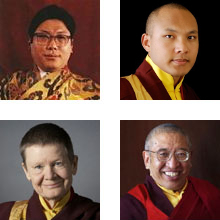 Gampo Abbey is supported primarily by individual donations. You can assist the Abbey at any time by making a monetary gift in Canadian or U.S. funds as a one-time or recurring donation. All donations are sincerely appreciated and are tax deductible. We welcome donations from any country, but tax receipts can be provided only for US and Canadian donations; see below for more details. Fees paid by residents only cover a small portion of the operating costs of the Abbey. We will use these funds to assist with day to day operating costs of running the Abbey including on-going maintenance and renovations of our buildings. The Abbey provides support for those who make a commitment to become life monastics. 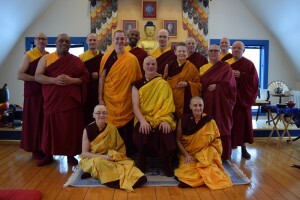 This support includes providing a place to live, a community dedicated to meditation practice and study of the dharma. It also includes providing a set of robes for all life monastics. While the Abbey provides financial support for the majority of Gampo Acharya Pema Chödrön’s expenses while she is at the Abbey, on retreat, or traveling, this fund provides resources to cover additional, personal expenses. The Abbey supports temporary monastics who need financial assistance to cover the costs of the monthly resident’s fees and general living expenses. Assistance is also provided for non-residents to participate in In-House retreats, Monastic Youth dathuns, and other programs open to the public offered at Gampo Abbey. Following a long tradition of releasing animals from captivity, our annual lobster release pays the cost to purchase and release the last catch of lobsters from one of the local Pleasant Bay, NS lobster fishermen. Gampo Abbey has partnered with Canada Helps, a Canadian not-for-profit company that specializes in securely processing online donations. Click the button below to go to a form where you can make a donation and pay with your Canadian credit card. All donations are tax deductible. Tax receipts will be issued by Canada Helps, not by Shambhala International or Gampo Abbey. You may also make a donation to Gampo Abbey via your PayPal account (Canadian). All donations are tax deductible. Shambhala International will provide you with a receipt at the end of the tax year. US residents may pay with their US credit card or through your PayPal account. All donations are tax deductible. Shambhala International will provide you with a receipt at the end of the tax year. Canadian residents may make a donation to Gampo Abbey using your Canadian credit card, you can phone the Finance Office at 902-224-1358 between 1:30 and 4:30 Atlantic Time. Please note, we are unable to offer tax receipts to US donors who make their donations using their US credit card if that information is provided by phone. For US residents wishing tax receipts we recommend making a donation online using your credit card via the link above or through a cheque sent by mail to the Abbey, details below. US residents should make their cheques payable to Gampo Abbey USA. Canadian and international residents should make their cheques payable to Gampo Abbey. Be sure to identify which project you would like your donation to support by including that information in the memo line of your cheque. Unfortunately, we cannot provide tax receipts for donations from outside the US or Canada. TERMS AND CONDITIONS: All donations given for a specific fund will be used only for that fund’s activities. All donations are tax deductible and a receipt for all donations given during a particular year will be provided at the conclusion of that year. It is understood that no goods or services are provided for these donations. RETURN/REFUND POLICY: With donations, there is no expectation for refunds. However, if we have made a mistake, please contact us by emailing us at finance@gampoabbey.org, calling us at 902-224-1358, or writing to us at Gampo Abbey, Attn: Finance, 1533 Pleasant Bay Rd., Pleasant Bay, NS B0E 2P0 Canada.